I realized about five years ago that it seemed there were many more independent producers in southern France than when I started importing wine. So I decided to find out if this was true. Back in one of my previous ramblings about what’s changed over the time I’ve been importing wine, I wrote that I thought there were more independent producers in the Rhône Valley and the Languedoc than when I started the business. Talking to people representing the wine industry in both regions, I got vague anecdotal confirmation of this, but never any actual data. So I decided to ask for numbers. Are there actually more independent producers than there were in 2000? Since the appellation rules of the regions don’t allow new land to go into wine production, more independent producers translate to less acreage and grapes going to the cooperative wineries. What would be the implications of this? The short answer to the first question is that this is happening, although I still don’t have more than a bit of hard data. And no one was willing to speculate about what it means on the record. Still, I learned some things, as you’ll see below. But first, some background. I picked 2000 as a start date because of the increase in elevation of villages to cru status since then – the highest possible category for their regions – in both the southern Rhône Valley and the Languedoc. This has been the case with Vinsobres and Cairanne in the Rhône. Also, some villages now have Côtes du Rhône Villages designations that were previously Côtes du Rhône. The Languedoc revamped its classification system in 2007, adding several crus. And there have been more since then, like AOP Pézenas. But even in some of the older, established Languedoc crus, the rules changed in the 2000s to allow cru recognition for white wines (and more occasionally, rosés) where previously only the red wines were eligible. I’ve written a lot about cooperative wineries and I think they’re great. Not everyone wants to make wine (or can afford to do it), and cooperatives offer the opportunity for farmers to grow grapes. The farmers also own the cooperatives and have a say in how they’re managed and run, and what wines get made. In a time when independent winemakers sometimes reject the rules of their local appellations and make whatever wines they want, the cooperatives have a mandate to retain their regional traditions in addition to making wines in a wide range of prices. But for growers who have considered making their own wine instead of selling their grapes, an increase in status could tip them in the direction of doing it. Wines with higher status generally command higher prices, which could make a difference in deciding to make wine. As I said, I didn’t get much information about these changes, with one exception. The American reps for the Languedoc producers’ association passed along my question and got a response from the head of the syndicate for wine producers in Saint-Chinian, one of the prestige Languedoc appellations. Over the past 15-20 years, approximately 10% of the total acreage that supplied Saint-Chinian’s cooperatives has been withdrawn. Of that 10%, 70% has been used by the owners/growers to create their own wineries. The remaining 30% was sold by the owners to outsiders who have started what they call “Caves Particulières,” or personal wineries. The 70/30 ratio surprised me, because my impression visiting in 2013 and again in 2018 was that there were a lot of non-French people making wine in the Languedoc. But it makes sense that organized importer trips for Americans would feature more English-speaking winemakers (and I spoke with more than a few Brits and Americans making wine in the Languedoc while I was there). The syndicate of Saint-Chinian wine producers gave me some data on land that had been producing grapes for the wine cooperatives in 2000 that’s now run by independent producers. Since I received only the percentages, I did some research to calculate numbers. According to information from the Saint-Chinian syndicate and a few producers in the region, there are currently eight AOC Saint-Chinian cooperatives with about 350 grower-owners. This means that approximately 39 growers left the cooperatives since 2000. Twenty-seven of them decided to make wine for themselves, and 12 sold to outsiders who started new wineries. Thirty-nine new wineries would definitely be visible in an area like Saint-Chinian, which now has around 100 independent producers. 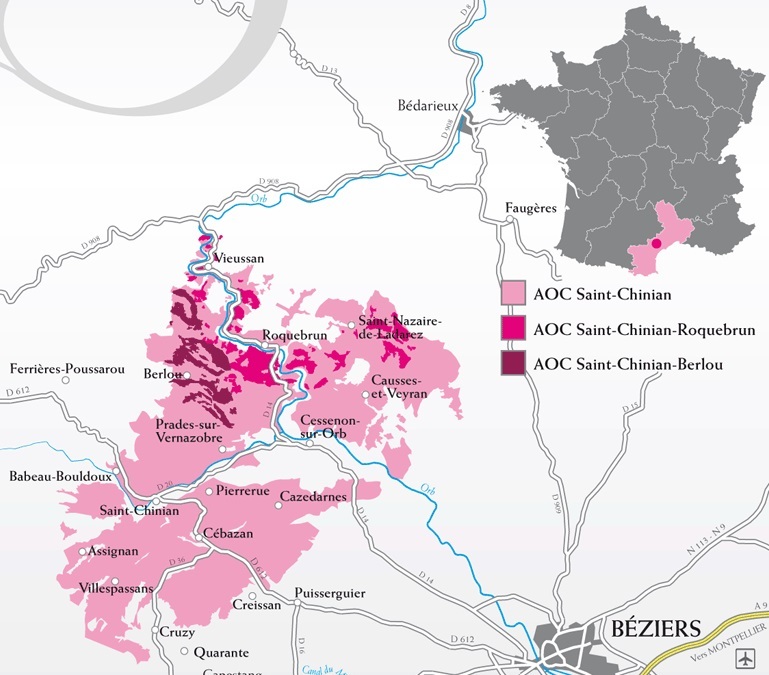 AOC Saint-Chinian accounts for approximately 10% of the Langeudoc’s production. If the same sorts of figures apply region-wide, then the Languedoc could have about 400 more independent producers than it did in 2000. ** So even if that’s not the exact number, my perception of more independent Languedoc wine producers was right. I wasn’t able to get any numbers from the U.S. representatives for the Rhône Valley. They sent me links to articles on consolidation of small cooperative wineries in the region, however. The articles cited increases in efficiency as the primary reason for consolidation. For example, one cooperative might have a more sophisticated bottling setup or more storage capacity than another, so that some cooperatives could be closed. I don’t doubt that efficiency factored into the decision. But it’s also possible that fewer participating growers was a factor in the closings, although that’s not discussed in the articles. I hope I haven’t made these numbers sound alarming. I don’t know if they represent a growing trend, or if the increase has leveled off. For me as an importer, it’s a mixed bag. More independent producers mean more wine stories, and that’s good for business. On the other hand, cooperatives are an important part of the regions’ wine traditions and they’re also major employers in their villages. I’ll be watching closely to see how this plays out in the future. ** Note that these numbers are averages based on data for Saint-Chinian as a whole. Obviously, there could be a few larger producers that drive things, so 39 producers may represent the upper limit. It could also be a stretch to use Saint-Chinian’s figures for the entire Languedoc region. But hey, with enough caveats it’s worth a shot, right? Cy and I are going to a Greek dinner party this weekend, and that had me thinking about an old recipe I used to make back when I was in graduate school. I had a Greek classmate and a bunch of us decided to make him Greek food for his birthday. I had made chocolate chip strudel for one of our holiday parties, so the others knew I had used phyllo pastry before. I was volunteered to make the spinach and feta pies. This was back in ye olde pre-internet days, so I went to the public library to take out a Greek cookbook. I don’t remember which one I borrowed, but it was meant for American kitchens and was kind of ahead of its time. The spinach pie was made in muffin tins lined with squares of layered phyllo. Instead of brushing the phyllo with melted butter, though, this recipe called for brushing with olive oil. Nowadays, you can buy frozen phyllo cups, and perhaps you might want to use them for this recipe. But the frozen cups aren’t made with butter, and they aren’t made with olive oil, either, so the ones you make yourself will definitely taste better. I’ve made some improvements, like using real onion and garlic, and adding some lemon zest. Also, these days you can find Feta that’s at least partially made with sheep’s milk, and it has a lot more flavor. The original recipe called for some sour cream, but you can use Greek-style yogurt (probably not made in Greece, but at least it has “Greek” in the name). And depending on how big your muffin tins are (every one seems to be a slightly different size), you may have leftover filling. You can bake that separately and slather it on toast for breakfast. I’d serve the pies with a hearty red wine, like Château d’Assas Réserve ($18). It’s made from Syrah, Grenache, and Mourvèdre, and is great with Feta cheese. It’s not Greek, but this recipe really isn’t anymore, either. Still, you can put on the right music and pretend you’re a French-American remembering a wonderful Greek vacation! Lightly brush the baking sheet and muffin tin cavities with olive oil. Place a sheet of phyllo on the baking sheet and brush with no more than 1 teaspoon of oil. Put another sheet on top and brush it with oil. Continue until you’ve used up the phyllo sheets. Using a sharp knife, cut the stack of phyllo into 12 pieces, 3 cuts on the long side of the stack and 2 on the short side. Gently lift each square (use a spatula if you need one) and put each inside one of the muffin tin cavities. Press the phyllo into the sides of the cups. Bake for 8-10 minutes, until the inside of the cup turns a little golden. Remove the pan from the oven and let it cool for 10 minutes. Meanwhile, make the filling. Heat 2 tablespoons olive oil in a skillet, saute the onion with the oregano, thyme, a pinch of salt, and ¼ teaspoon of pepper for about 8 minutes until translucent. Stir in the garlic and cook for another minute. Stir in the chopped spinach and parsley, you want everything to be incorporated. In a medium bowl, mix the egg, lemon zest, and Feta until the cheese crumbles are nearly smoothed out. Add the spinach mixture and mix well. Taste the mixture for salt, and also check to see it’s not too dry. You should be able to squeeze it together with your hands and have it stay together looking moist. If it won’t, add Greek yogurt or sour cream a tablespoon at a time until it will. Set the filling aside. Fill the phyllo cups with the spinach filling. Bake for 10 minutes and check to see the color of the phyllo edges. If they look really brown, drape a sheet of foil over the pan and continue baking. The cups should bake 20-25 minutes and not over-brown. Take the pan from the oven and let it cool for a few minutes. Then gently remove the cups to a wire rack and let them sit another five minutes before serving. Note: if you have leftover filling, bake it separately in a greased ramekin. This entry was posted in Uncategorized and tagged AOC Saint-Chinian, buy wine online dc, Cooperative wineries, Independent wine producers, Muffin Tin Baking, Number of independent producers, Saint-Chinian, Spinach and Feta Pies, Tom Natan, Vignerons Independants, wine delivery washington dc, Wine producer statistics. Bookmark the permalink. Pingback: Terroirist: A Daily Wine Blog » Daily Wine News: Elegant Amarone?